I’m a sucker for cute things. I really do enjoy crochet cute things with big eyes. Goomba was no exception. For Mario fans, you should recognize this little cutie. I made him for a gift a while back and never got around to posting photos of him. He was about 10cm (4″) in height. I used 5 different types of yarn (mostly Bernat Supersaver or Red Heart Supersaver; the feet were out of Bernat Satin). 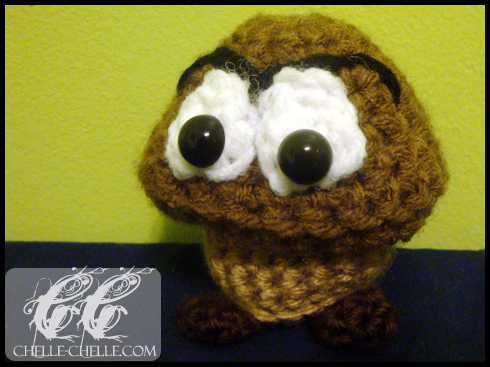 I did not use a pattern (I made it up as I went along) and I will not be publishing a pattern for him (mostly because I don’t remember what I did and because Goomba is a trademarked character by Nintendo). I hope you like him.